1. Stop lying about sea ice. The amount of sea ice on Earth is near a record high. 2. Stop lying about global warming. There hasn’t been any significant troposphere warming for 18 years. 3. Stop lying about climate models. They are a disaster and 97% overpredict warming. #4. Stop lying about sea level. 80% of tide gauges show less rise than the official “global average”. Many tide gauges show no rise in sea level, and almost none show any acceleration over the past 20 years. #5. Stop lying about drought. Droughts in the US are becoming less severe and less frequent, and the US has been wetter than normal over the past year. #6. Stop lying about snow. 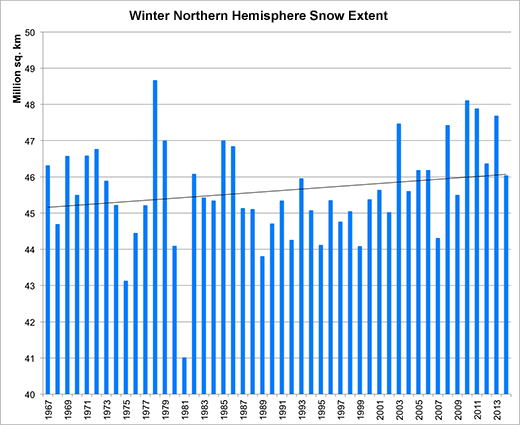 Autumn/Winter snow cover has increased to record levels. #7. Stop tampering with temperature data. By following any one of the simple principles of scientific integrity, a climate scientist can be guaranteed to be ostracized, have their funding cut off, have web sites set up to personally attack them, get fired, and possibly have the president of the US smear them.